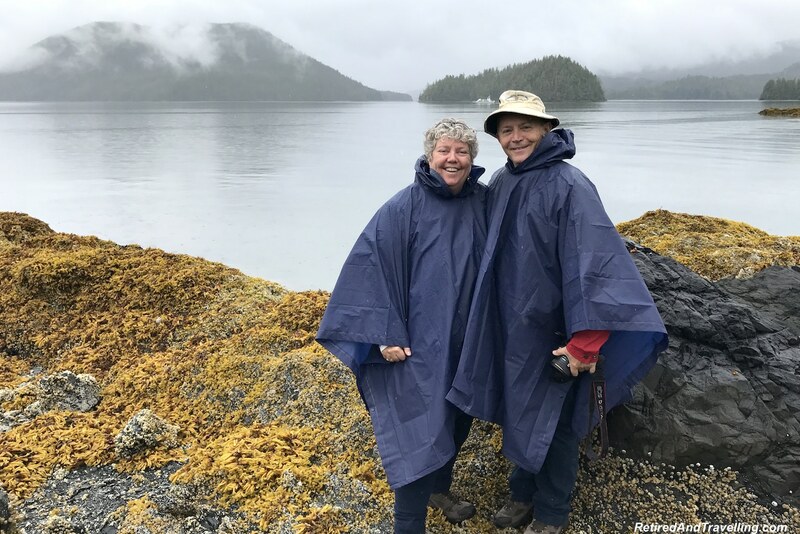 We had really enjoyed our day at sea as we cruised along the Tracy Fjord to see the Sawyer Glacier. 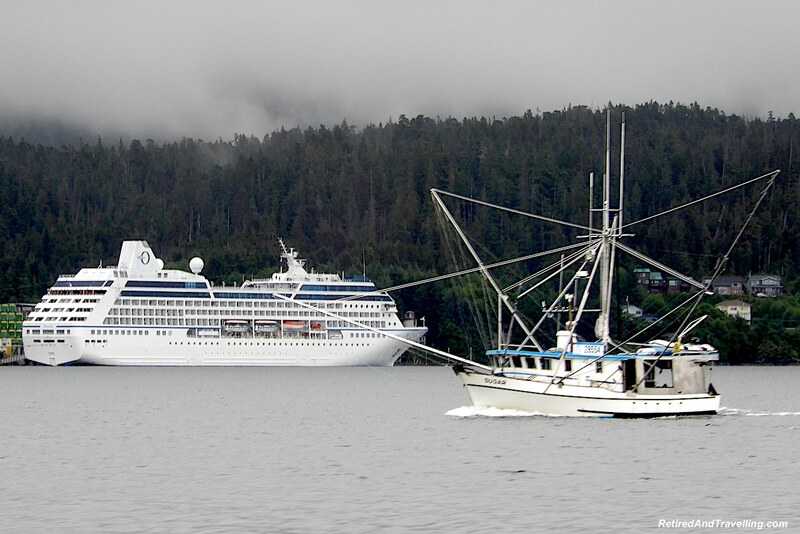 The next day was the first port day on our Alaska cruise. We woke up in the morning and were docked. There did not appear to be much civilization visible. 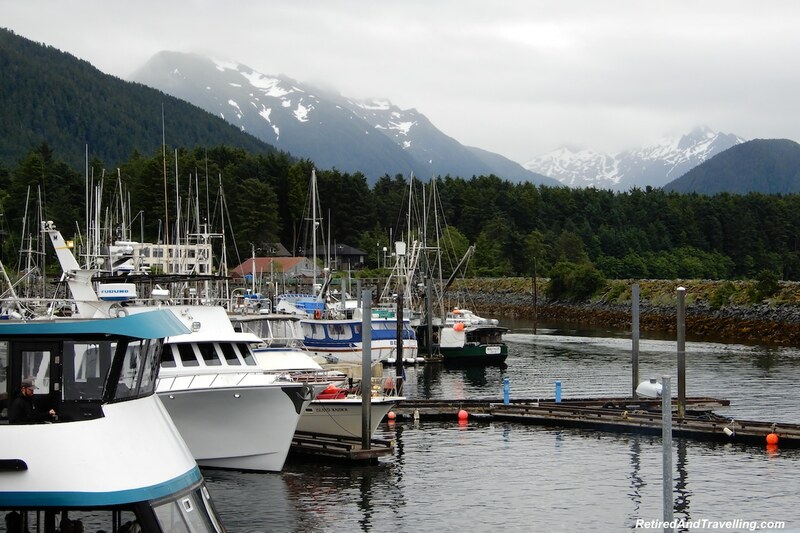 We were docked at Halibut Point and not in the main town of Sitka. 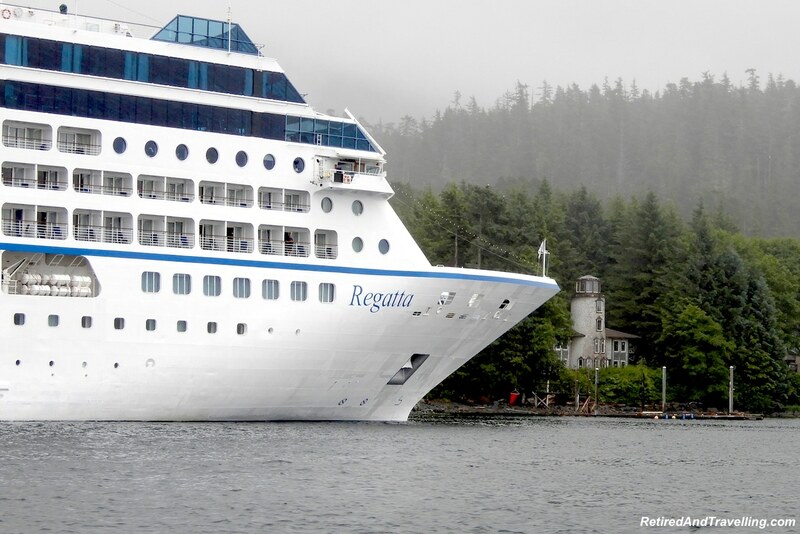 We later saw one cruise ship already moored in the bay outside of Sitka. Maybe that was their limit? 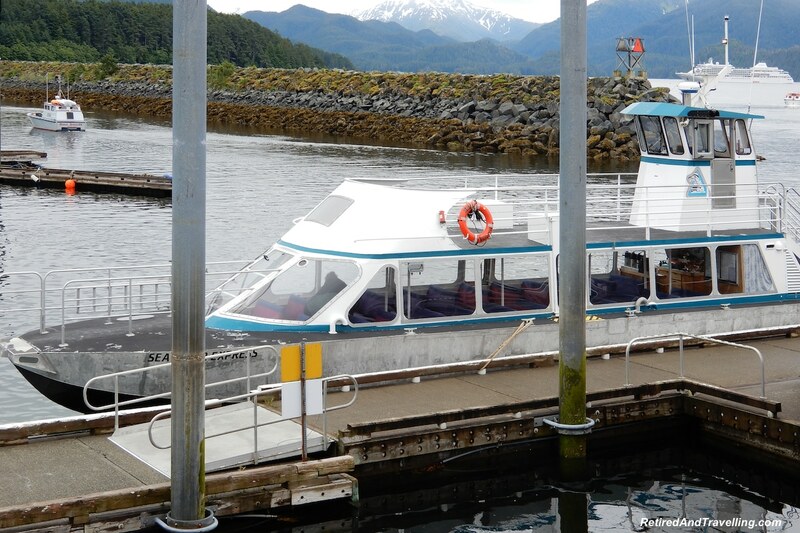 This just meant a short 10 minute shuttle ride into the town to visit Sitka in Alaska. Our tour departed from the town so we took an early shuttle in. 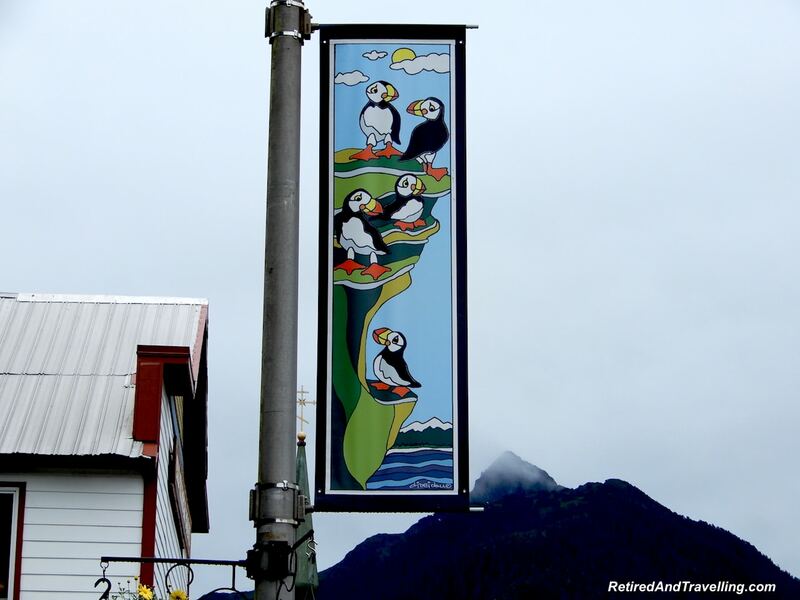 We wanted to see a little of an Alaskan town when visiting Sitka. The shuttle bus dropped us at the visitors centre. This was the meeting point for tours for both our ship and the other cruise ship that was tendering people to the dock. 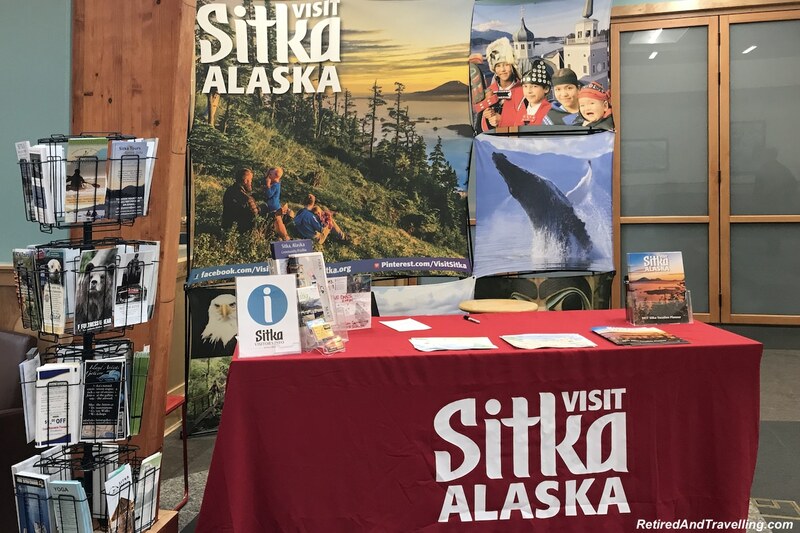 There were a number of tours that could be booked here when you visit Sitka in Alaska if you don’t book a ship cruise excursion. We wandered around the port area and caught some classic harbour views. The town was bright and colourful. Flowers were everywhere. It was not the classic view of Alaska we had expected. We wandered up and down the streets taking in the sights. The stores had a wide variety of local arts and tourist souvenirs. 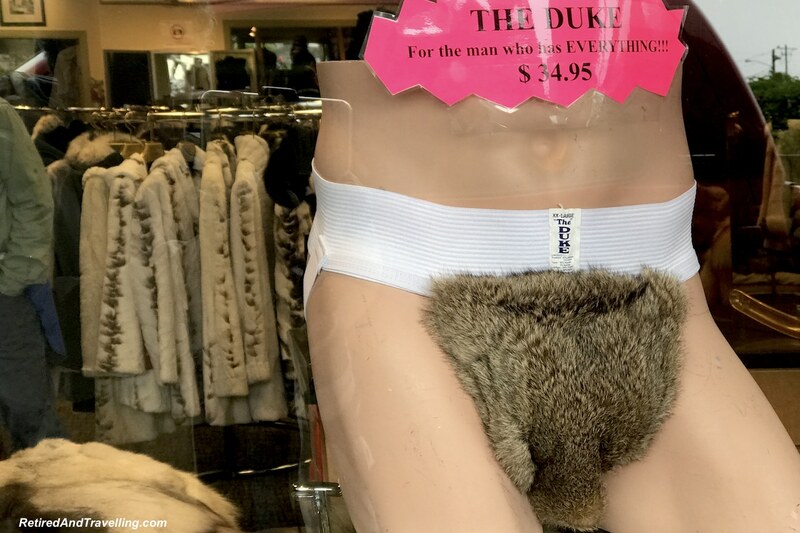 We couldn’t resist taking pics of the fur bathing suits. Or posing with the bears! 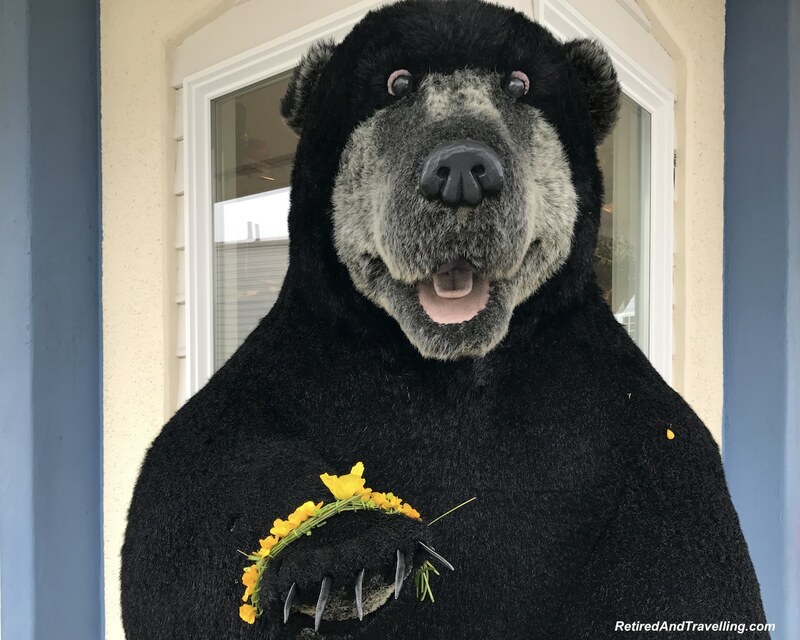 We booked a grizzly bear tour in Prince Rupert and hoped that posing with the bear was not our only bear sighting! 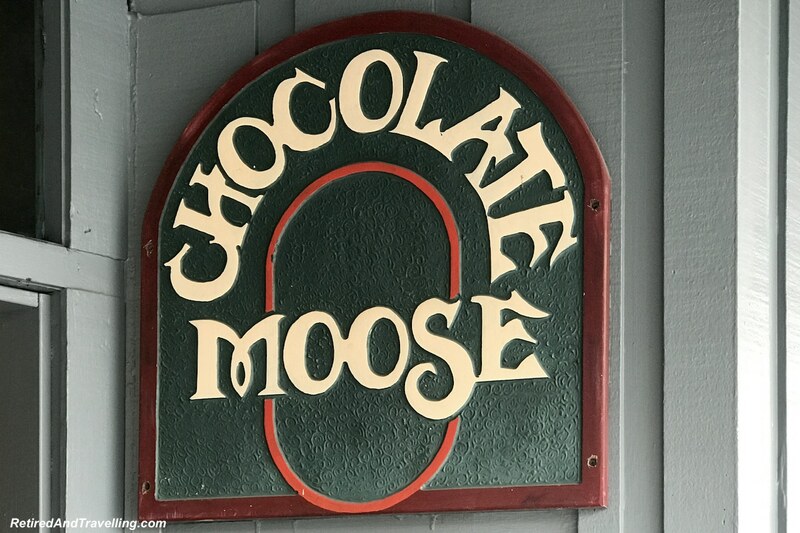 When we came to the Chocolate Moose shop, we followed our nose inside. There was a wide variety of chocolates. 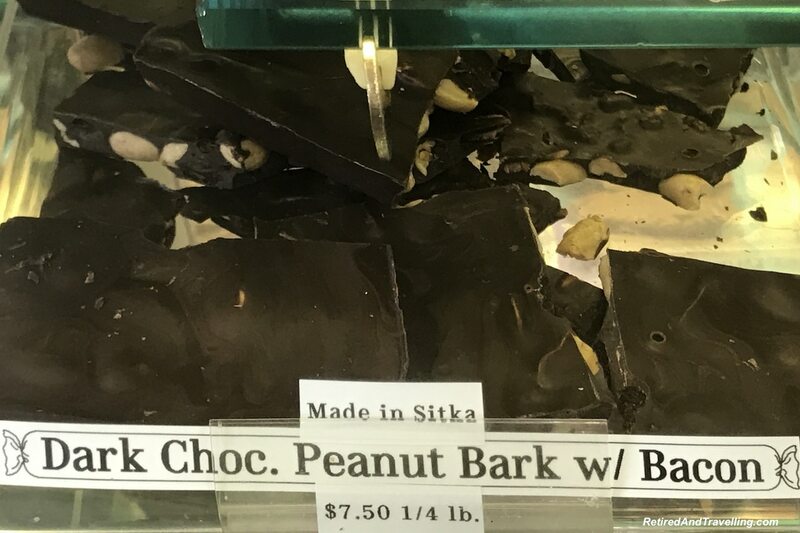 Of course we tried the dark chocolate bark with bacon. 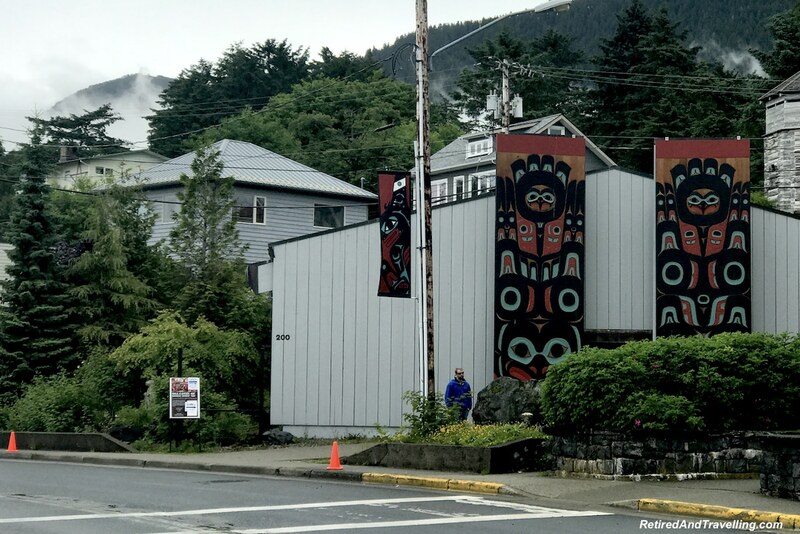 If you visit Sitka in Alaska, make sure to plan some time just to wander in the town. If you head away from town, you can easily walk to the Raptor Centre. 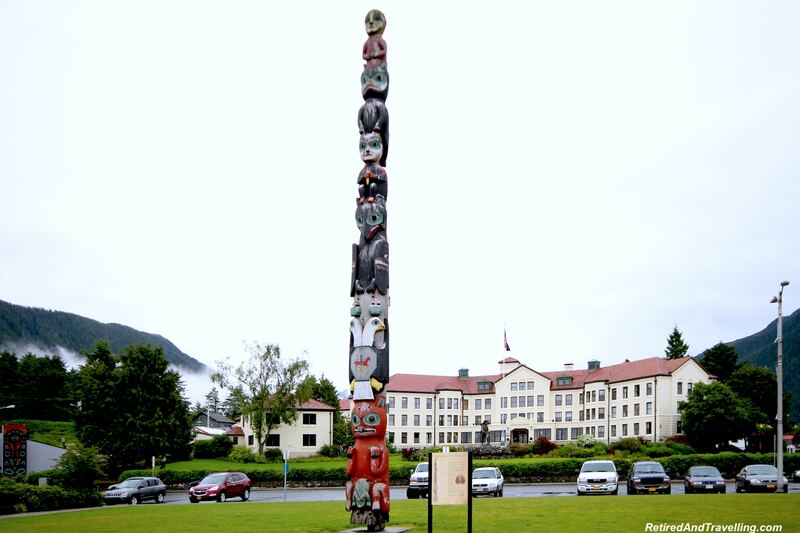 A little further along will take you to the Sitka National Historic Park with a great totem pole display. 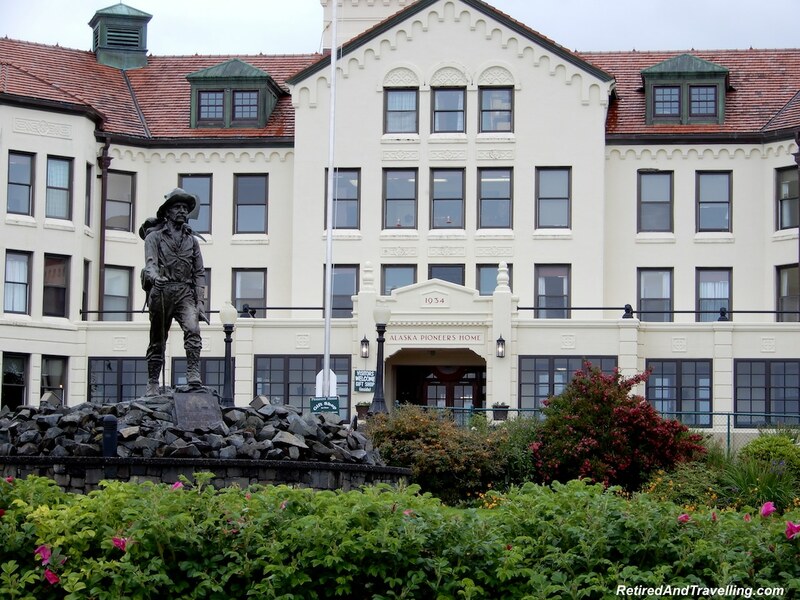 These may be excursions offered by your cruise ship but you can do them on your own. 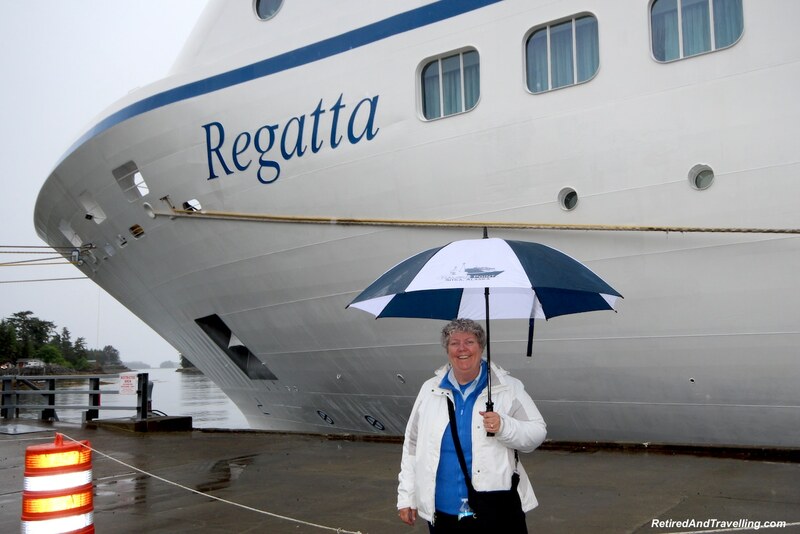 We walked back to the dock at the appointed time and found the person marshalling our tour. Our tour description said we would take a catamaran out so we watched for that boat to dock. But our tour actually went in a much smaller boat. There were few people on our tour so even with the smaller boat we had lots of room to move around. Always a good thing when everyone ran up to the top deck for sightings. 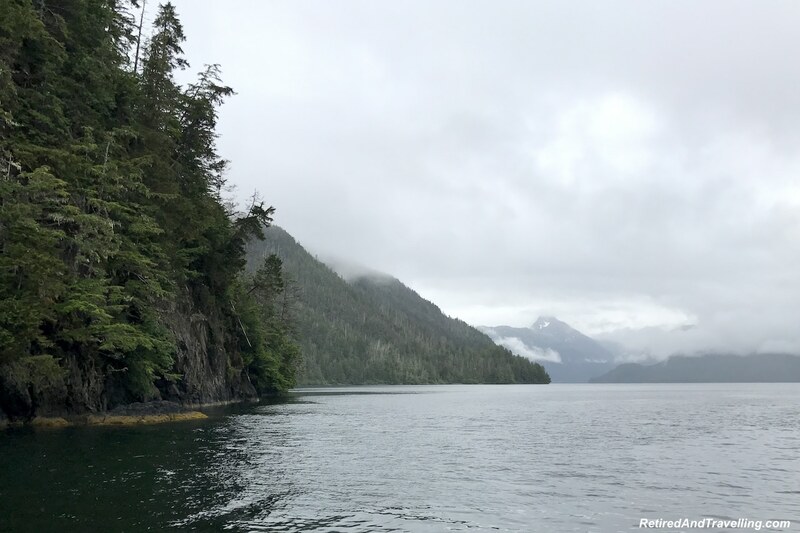 We had an enthusiast boat crew that clearly loved this part of Alaska where they lived. They were so excited to show us some of their favourite spots. 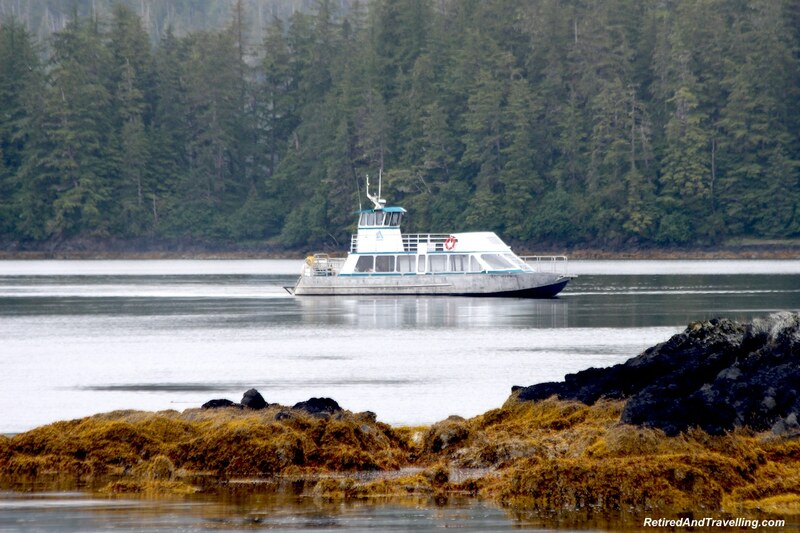 The boat moved out amongst the large number of islands that surround Sitka on Baranof Island. We were eagerly on the lookout for sea life. 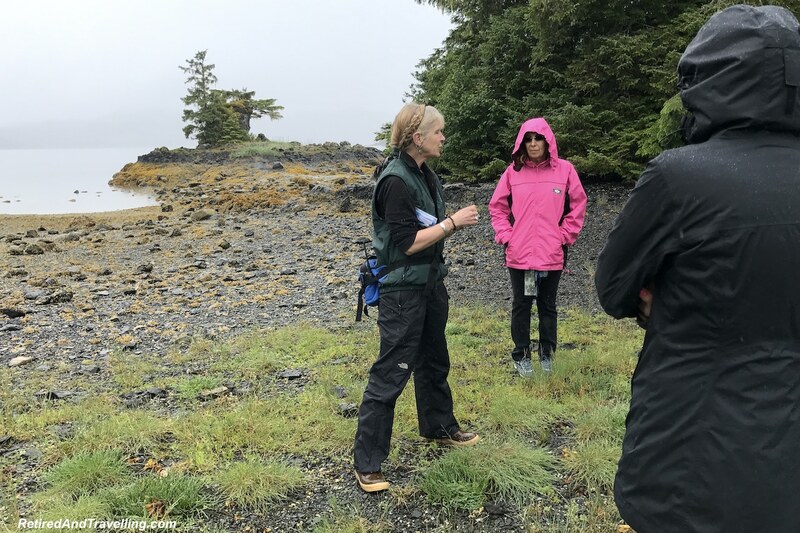 The tour description said we might see sea otters, seals, whales and puffins. We would not be so lucky! As we went we saw an occasional sea otter in the distance. 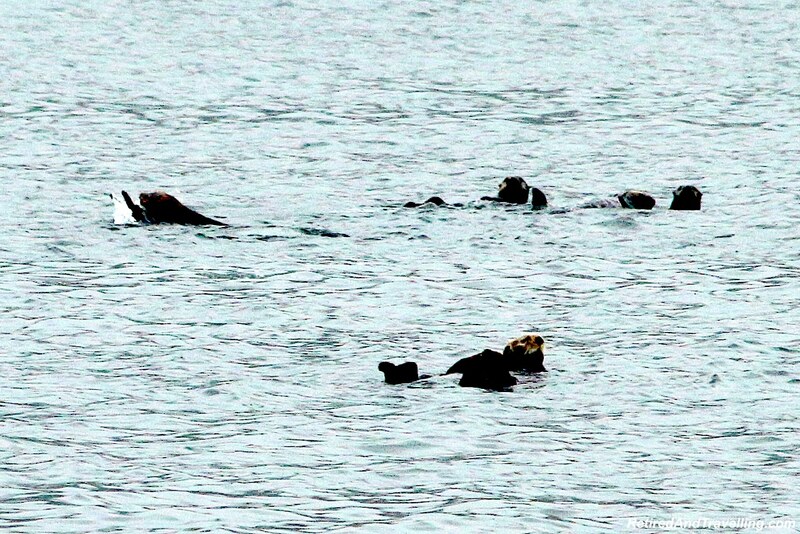 The single sea otters were quite wary and scuttled away from the boat. 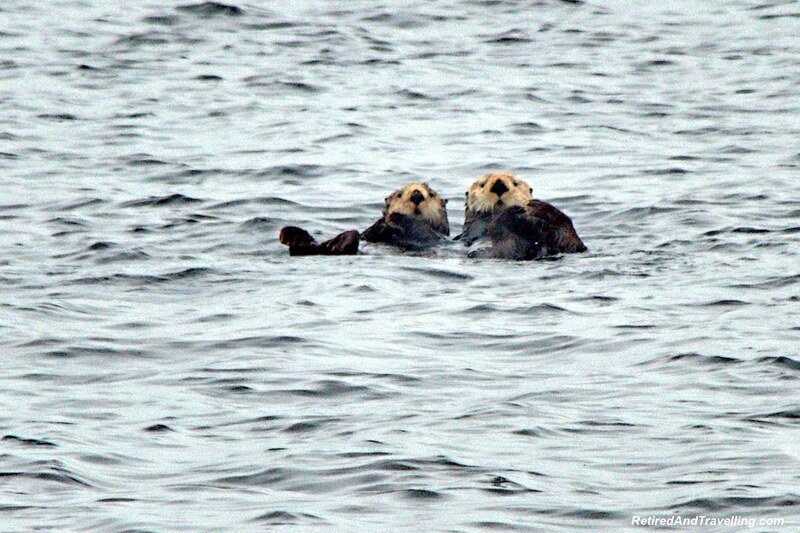 Later in the day we finally came upon a raft of sea otters. The captain slowed the boat to a crawl and slowly nudged us close. This large group seemed undisturbed with our presence. 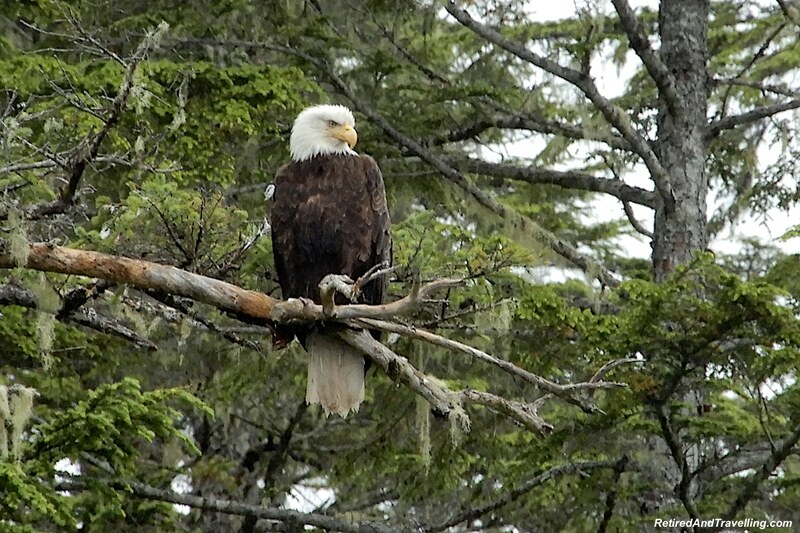 The crew pointed out several eagles high in the trees on shore. If they were lucky, people got their binoculars up fast enough to catch a sighting before the ship was out of range again. On the return trip, we actually stopped close to an eagle’s nest. 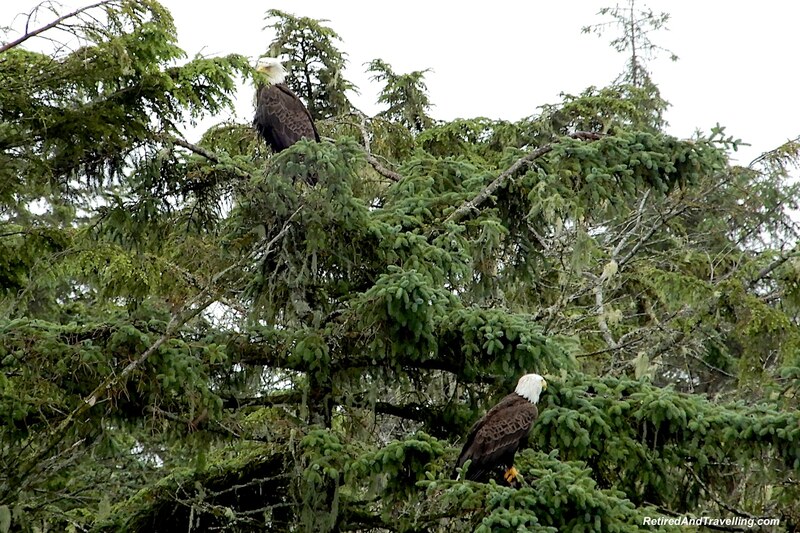 We finally got to see the eagles without a super zoom lens. 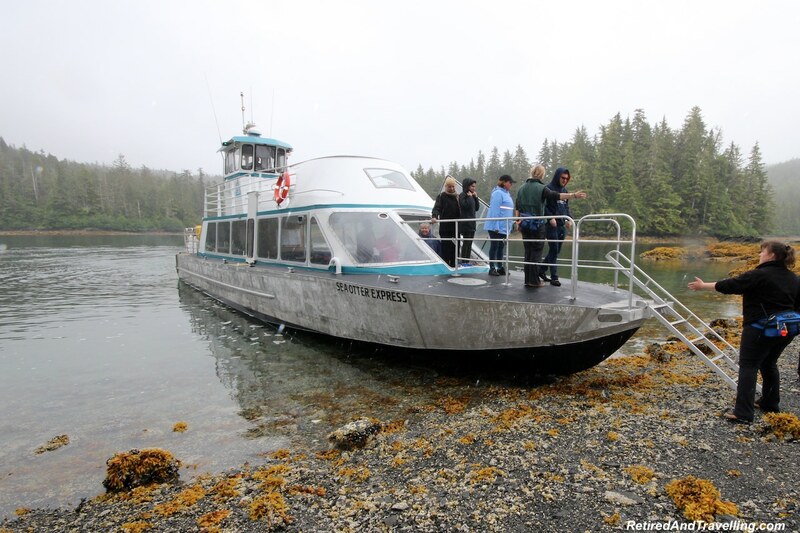 The captain brought the boat close to shore and we exited from the front gangway. 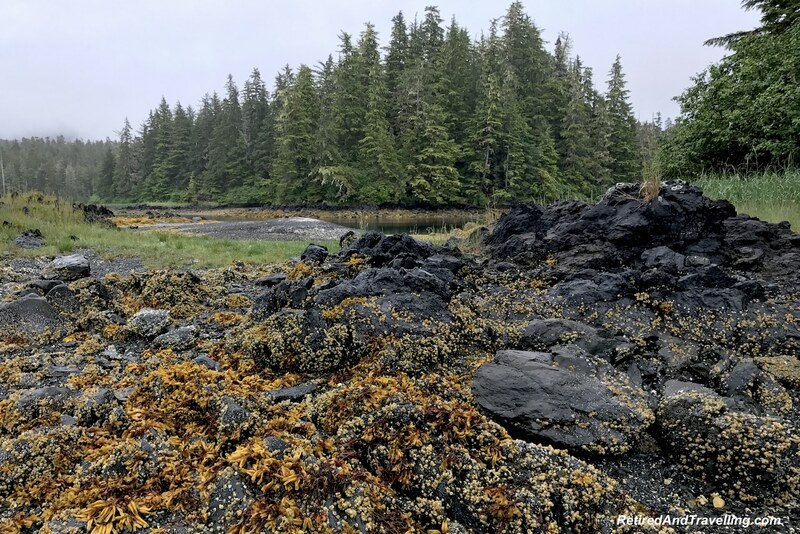 This was a much easier beach entry than when we explored the rainforest in Ketchikan. The boat pulled back and circled around waiting to pick us up in an hour. We landed on Starfish Island, a favourite of the crew. 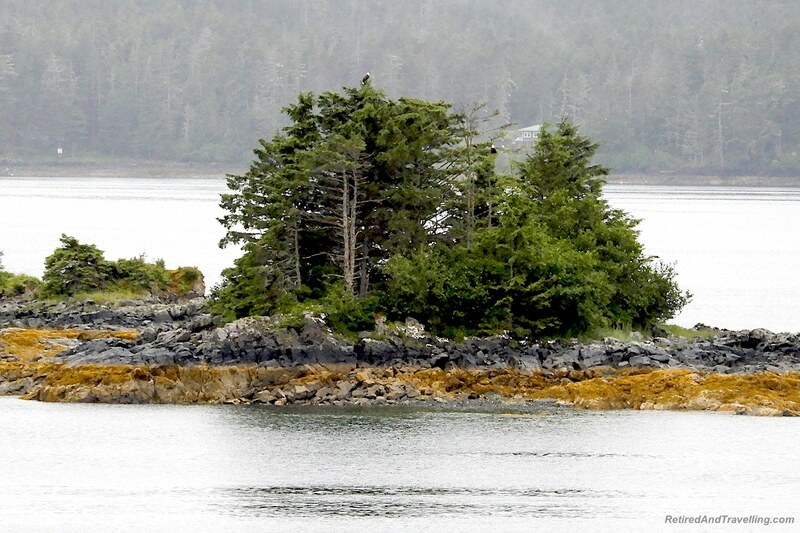 It was a very small island so we never really left the rocky beach area where we landed. 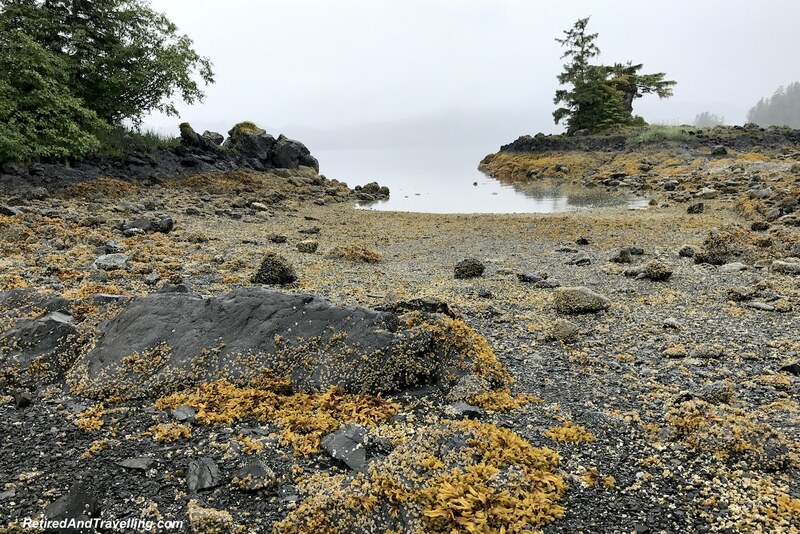 At low tide, we got a great view of the kelp that covered the beach. 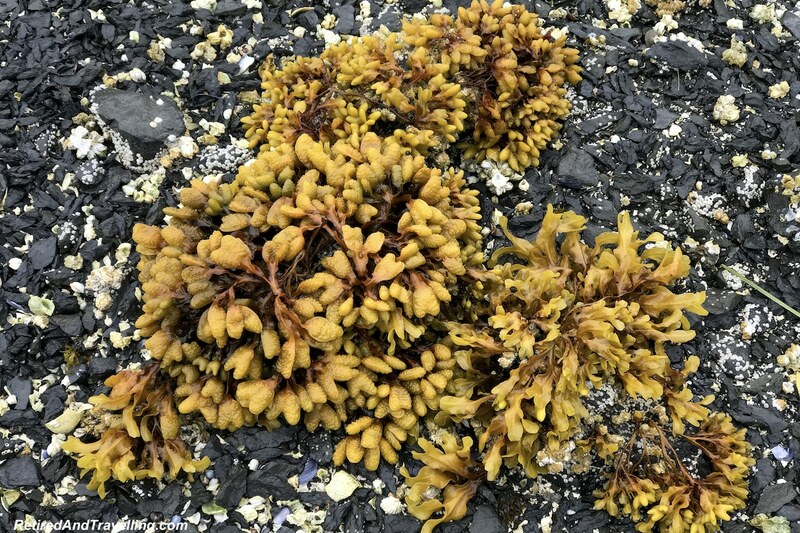 This kelp is apparently very good for you and is collected to eat. 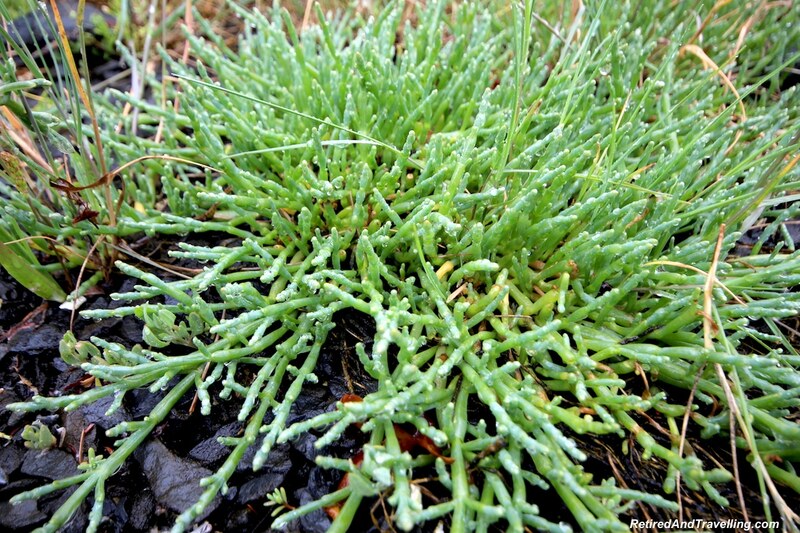 Our guides also brought sea asparagus for us to try and recommended the pine tip jam. 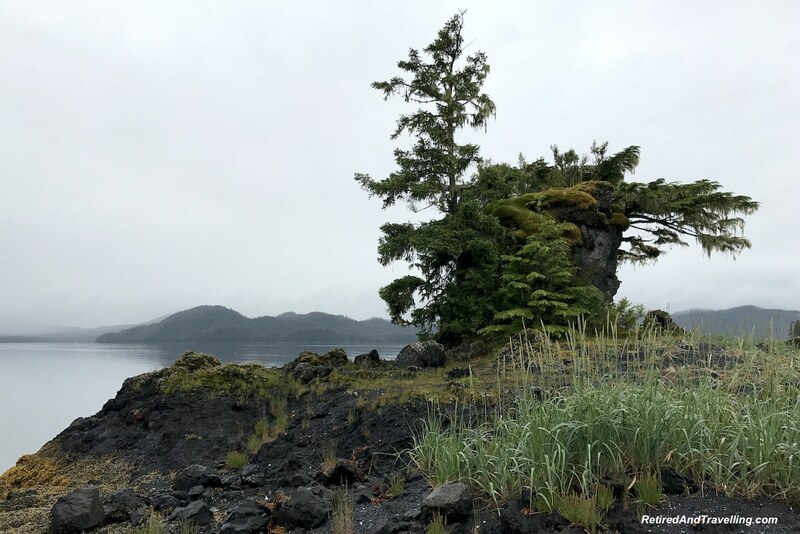 The outer islands around Sitka were formed from volcanic activity. 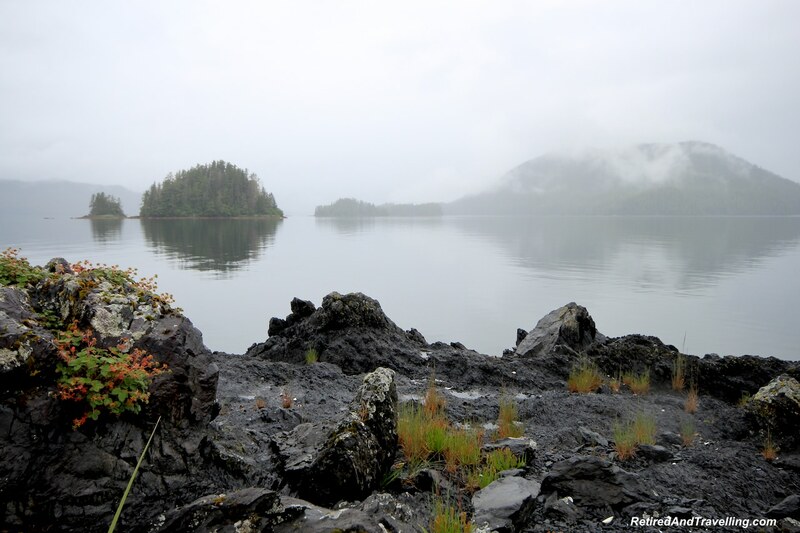 Whereas Baronof Island and others closer to the shore were formed by tectonic plate movement. We could see the black volcanic rock on the beach. It had certainly been a year to see volcanic lava for us. We started our year enjoying the volcanic Canary Islands! 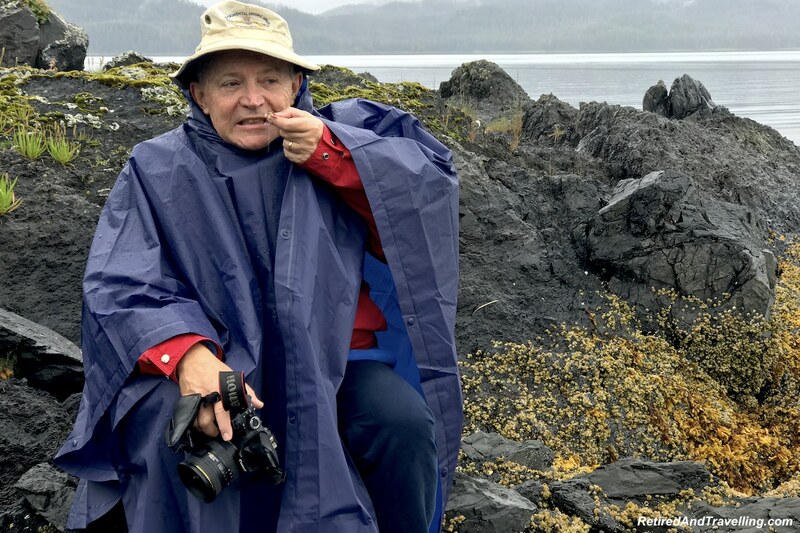 Unlike many of the other people who headed our for a nature walk in Alaska, we were well prepared for the weather. Dressed in our rain ponchos we enjoyed the misty views. 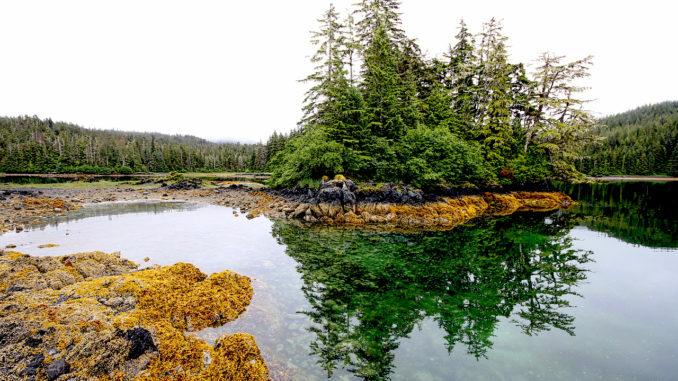 While the skies were grey, the palette was colourful from the very green trees and the yellows of the kelp. 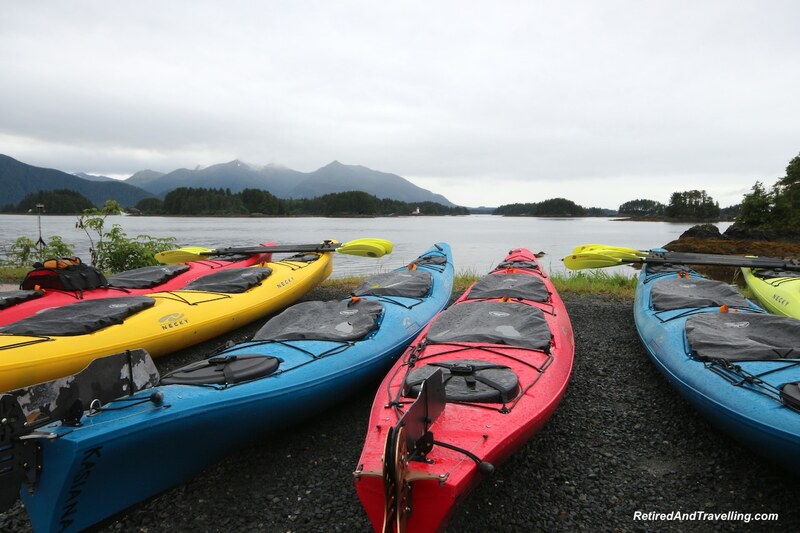 Take a boat and explore the islands when you visit Sitka in Alaska. Our tour ended very late so the boat actually dropped us back at our cruise ship. 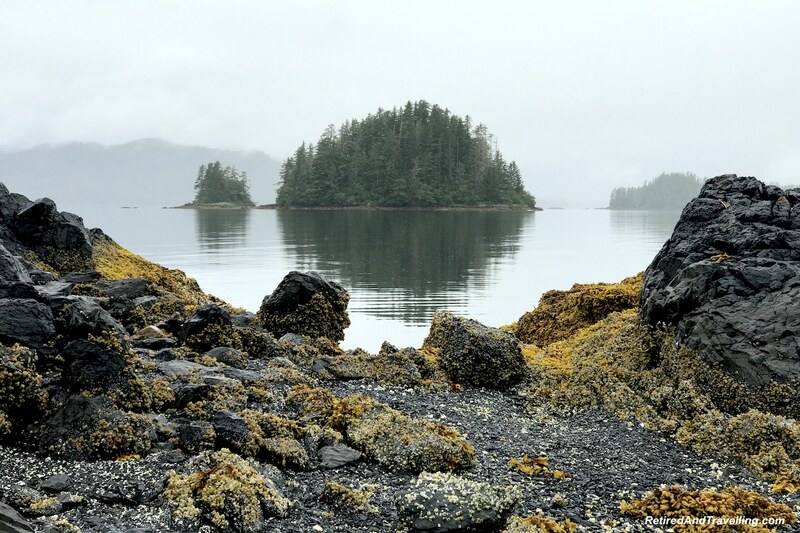 It had been a serene way to visit Sitka in Alaska. 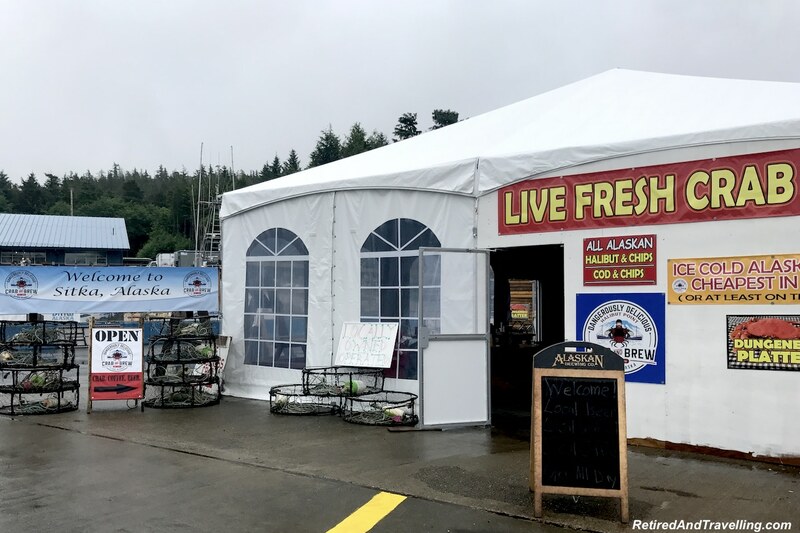 This was our last stop in Alaska before we headed back south. 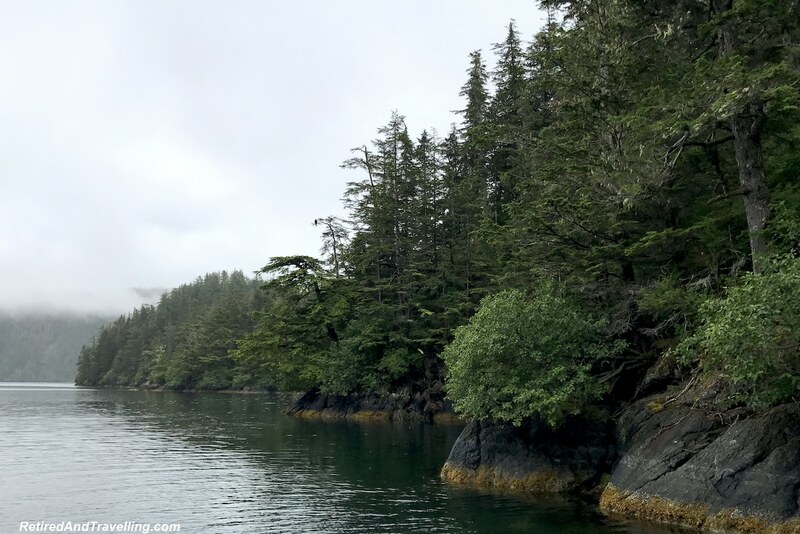 We remained disappointed with how little wildlife we saw on our stops in Alaska. It was a good thing that our day cruising the Tracy Fjord had been so exciting. 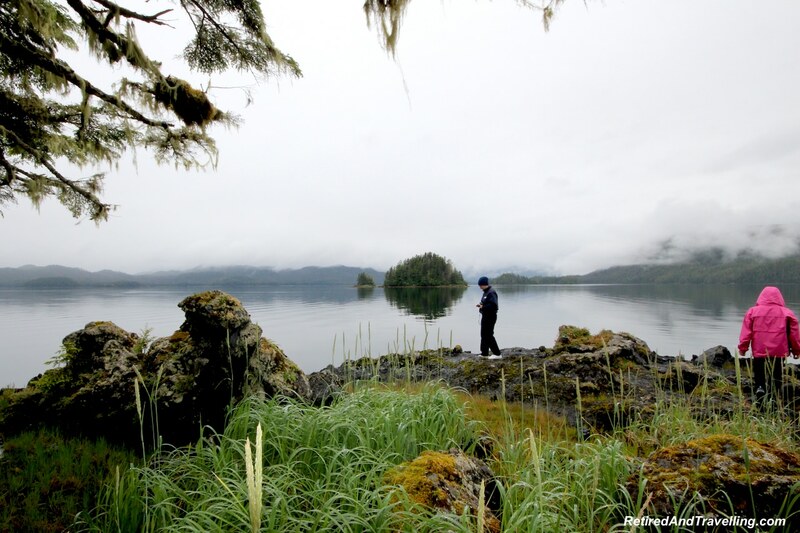 Our next excursion was a grizzly bear experience in Prince Rupert. 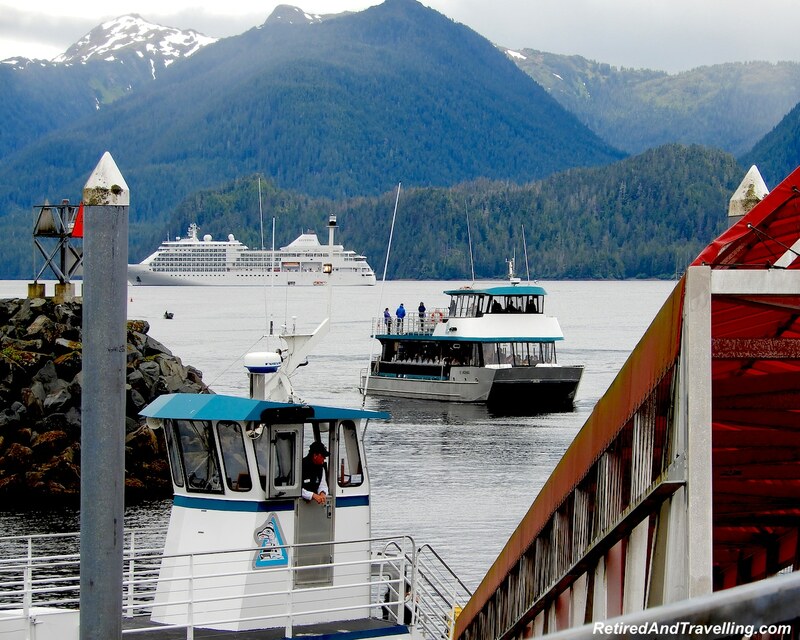 This would be the wildlife highlight of our Alaska cruise. 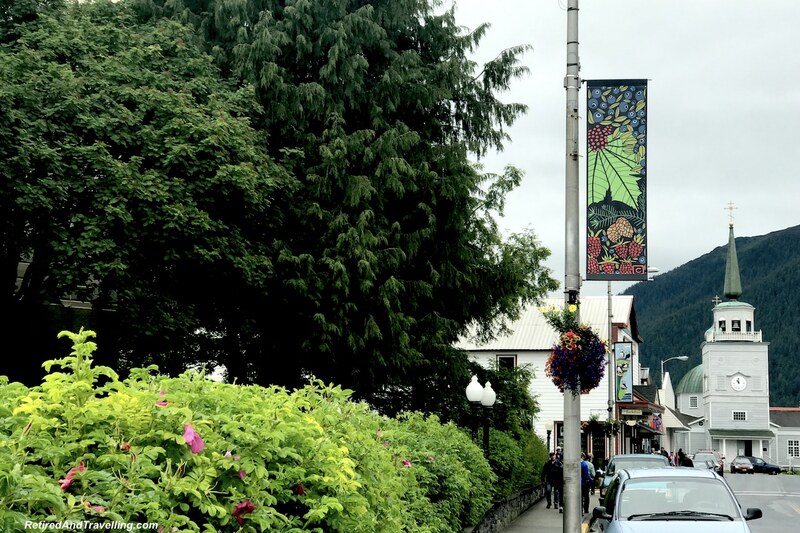 What did you do visiting Sitka in Alaska? 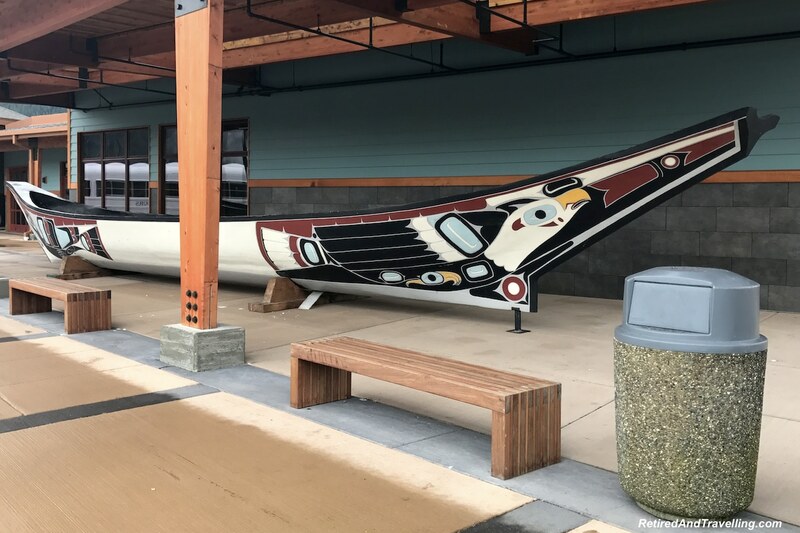 What would you recommend for other people taking a cruise to Alaska?